I have recently recovered 3 partitions from a 3x2TB RAID5 array (thank you btw) with a quick scan using TestDisk, after the raid controller decided to trash the file system during an unrelated hardware upgrade. The remaining issue now is it still hasn't found this 128MB system reserved partition, it did not show up among the sectors found during the initial scan, and the deep scanning takes a very long time for an array of this size so I wanted to check here first if there is some better way. How to find this and what should it look like if there is no standard file system on it? 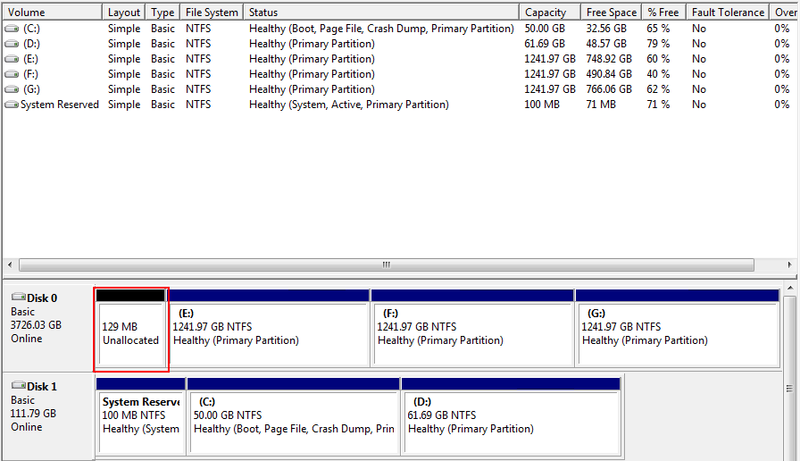 Run TestDisk, Analyse, Quick Search, Stop, Deeper Search, wait at least until your 1.2TB partition is found and press Stop. Is the 128 MB partition listed ? filewin32_getfilesize(\\.\Y:) GetFileSize err Incorrect function. filewin32_setfilepointer(\\.\Y:) SetFilePointer err Incorrect function. Disk /dev/sda - 4000 GB / 3726 GiB - CHS 486401 255 63, sector size=512 - Intel Raid 5 Volume, S/N:v0-r5, FW:1.0.